Champions time: Westport United celebrate after claiming their fourth Super League title in a row. 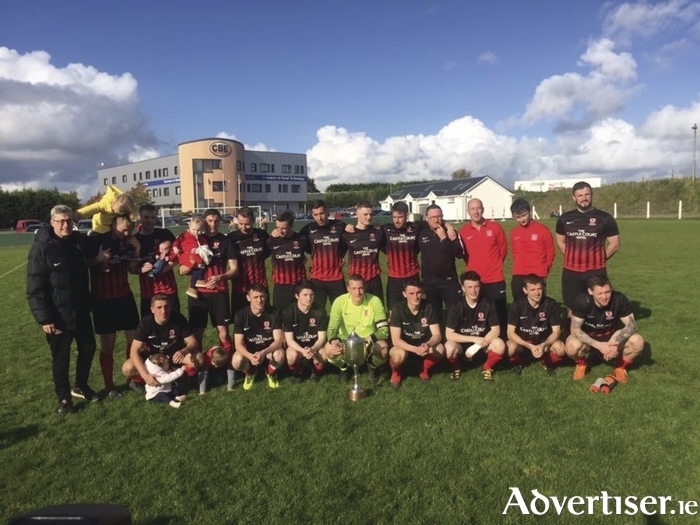 Westport United complete historic Super League four-in-a-row, while play-offs are required to settle the final relegation spot in both the Sports Super League and the Premier Division. In the Super League the early drama involved the teams in the battle to avoid the drop, while later in the day Westport United clinched the title with a convincing 4-0 win away to Claremorris. Phil Keegan had the Covies in front at the break, with further goals from David Hoban, Dave Cameron, and Adam Mulchrone. Westport completed the season with their 11th win in a row as they proved once again that they are the best team in the county. Manulla went into their game with Castlebar Celtic knowing they had to pick up the three points if they were to have any chance of winning the title, but Celtic had other ideas as a second half goal from Jose Sola was the difference between the two sides. The win for Celtic ensured they finished the season in third place and they also kept their unbeaten home record intact, while Manulla must also be happy with how the season went after pushing Westport right to the final day of the season. After 65 minutes of the early action in the morning games in the Super League it looked like Ballyheane would join Achill Rovers in the Premier Division next season as Glenhest Rovers led at home to Ballina Town. A point would have been enough for Glenhest to stay in the Division but Ballina hit back with five goals from Ian O'Dowd, Eugene Gorman, Mark Birrane, and Dylan McKee (2 ) to leave Glenhest in a play-off with Ballyheane who kept up their end of the bargain with a 6-2 win over Achill. In the final Super League game Ballyglass finished their season on a high with a 3-1 win over Straide and Foxford United. In the Premier Division there were plenty of calls and texts flying around as the three early games approached full time to see which of the five teams in danger would avoid the drop. Crossmolina left themselves with too much to do going into their game with Westport United B, and it proved to be the case as they were beaten 3-1 by Padraig Burns' side who finished the season by going unbeaten in their final seven games to pip Conn Rangers and Swinford to third position. The other relegation spot is still to be decided as Fahy Rovers and Killala will have to contest a play-off to see who goes down. Killala looked to have made sure of survival as they led 2-0 against Bangor Hibs after 50 minutes, with both goals coming from Rory Gallagher, as a win for Aiden Sweeney’s side would have been enough to keep them up. Hibs though were also in the dog fight and needed at least a point to make sure of safety, and in a 10 minute period midway through the second half they turned the game on its head thanks to goals from Justin Healy, Brian McHale, and Tommy Conroy. At this stage Killala were now going down as Fahy Rovers and Ballyhaunis remained scoreless in Solar 21 Park, but to their credit Killala didn’t give up, and as the game headed into injury time they were awarded a penalty as Mikie Conroy handled the ball in the box. Killala’s David Cadden stepped up and he kept his cool to slot the ball past Pat McHale in the Hibs goal to give his side the point. That leaves them in that play-off with Fahy Rovers who just could not find a winner against Ballyhaunis Town. At the top of the table, Iorras Aontaithe completed the remarkable achievement of going unbeaten through the season with a 6-0 win away to Conn Rangers. Brendan Nallen made it 20 league goals for the season as he hit another hat-trick, while the other goals came from Tom McAndrew, Kyle O’Reilly, and a penalty from Gareth O’Malley. Already promoted Kiltimagh/Knock United finished off their season with a thrilling 5-4 win in Swinford with the goals coming from Matthew Leadbetter (2 ), Shawn Groarke, Stephen Wallace, and Gavin Groarke.